For the past three decades Marcos Silva has poured his energy into spreading the gospel of Brazilian music, playing an inordinate role in the San Francisco Bay Area’s emergence as a verdant outpost of Brazilian jazz. Taking a break from his tireless work as an educator, the Rio-born pianist/composer delivers a gorgeous state-of-the-art statement with "Brasil From Head to Toe," his first new album in 30 years. 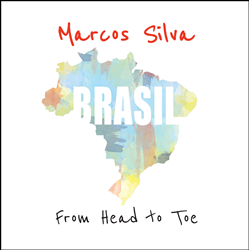 Marcos Silva's new CD, "Brasil From Head to Toe." This CD is a chance to learn where I'm coming from. This is who I am. All of my DNA is in there. Keyboardist and composer Marcos Silva returns to the recording spotlight after 30 years with "Brasil From Head to Toe," set for a May 3 release on his Goose Egg Productions imprint. The third album from the Brazilian-born, Bay Area-based musician and educator features an extensive cast of musicians, anchored by a core quartet with saxophonist Gary Meek, bassist Scott Thompson, and drummer Mauricio Zottarelli. It also includes 10 original compositions of invigorating Brazilian jazz fusion by the master himself. Silva spent the three decades since recording his first two albums, 1987’s "Here We Go" and 1989’s "White & Black," touring and recording with the likes of Flora Purim and Airto (for whom he also served a 24-year stint as music director), Paquito D’Rivera, and Jon Lucien, as well as keeping busy on the Bay Area’s ascendant Brazilian jazz scene and teaching for more than two decades in the Brazilian Music department at Berkeley’s California Jazz Conservatory (formerly The Jazzschool). With Brasil From Head to Toe, he summarizes everything he’s done and learned in that long and accomplished career. Not just Silva’s DNA, but also his incomparable experiences as a musician living in Brazil and the United States and traveling the world. Tracks like “In 7 & 2,” “Hathor,” and “Dry Land” (among others) recall the electrified Brazilian fusion Silva played with Purim and Airto. “Dos Pés À Cabeça” gives traditional samba music a charge of slippery but bruising funk; “Escape” inclines toward progressive jazz (with the support of vibraphonist Dillon Vado); “Prediction” and “Spring” are slow samba-infused ballad offerings—the last featuring a lush arrangement for 12-piece string ensemble. Silva’s sumptuous but exacting compositions—which have been recorded by such artists as Purim, Romero Lubambo, Bud Shank, and Herbie Mann—call for interpretation by the highest caliber of musicians, and Silva’s bandmates are more than up to the task. Zottarelli, a New York (by way of São Paulo)-based drummer and percussionist, is highly sought after in the jazz, Latin, and Brazilian music communities. Meek, who lives in Monterey, is a fellow longtime veteran of Flora Purim and Airto’s working band (of whom Silva says, “after Michael Brecker, Gary is the saxophonist”). East Bay bassist Thompson is a protégé and colleague of Silva’s at CJC’s Brazilian Music department, and the son of woodwinds player Mary Fettig, with whom Silva worked on his first two albums. Marcos Silva was born September 8, 1954 in Rio de Janeiro. He studied classical guitar, bass, and drums at the city’s Museum of Image and Sound, becoming a mainstay on the music scene but ambitious to make his way into jazz. To that end, he arrived in New York City in March 1980, soon meeting famed vocalist Flora Purim and her percussionist husband Airto Moreira. The connection redirected Silva’s career, including his place of residence. He soon followed his new employers to their home base of Santa Barbara, California, relocating again three years later to the San Francisco Bay Area. He continued working with Purim and Airto, as well as joining guitarist Ricardo Peixoto’s Voz do Samba and later collaborating with Claudio Amaral’s Viva Brasil, and working with Brazil’s elite composers such as guitarist Toninho Horta and Dori Caymmi. In 1987 he made his debut album, "Here We Go," following it two years later with "White & Black." In the ensuing years, Silva became an active partner in the Bay Area jazz scene, helping to fuel a surge in its Brazilian jazz contingent and giving a boost to vocalists like Claudio Gomez, Claudia Villela, and Sandy Cressman. In the late 1990s he joined the faculty at The Jazzschool (now the California Jazz Conservatory) in Berkeley, helping to establish the new institution’s Brazilian Music department. He has remained there ever since as department head while also continuing to compose and perform actively.